This statistic depicts the results of the National Health and Nutrition Examination Survey (NHANES), which is conducted by the Centers for Disease Control and Prevention (CDC). 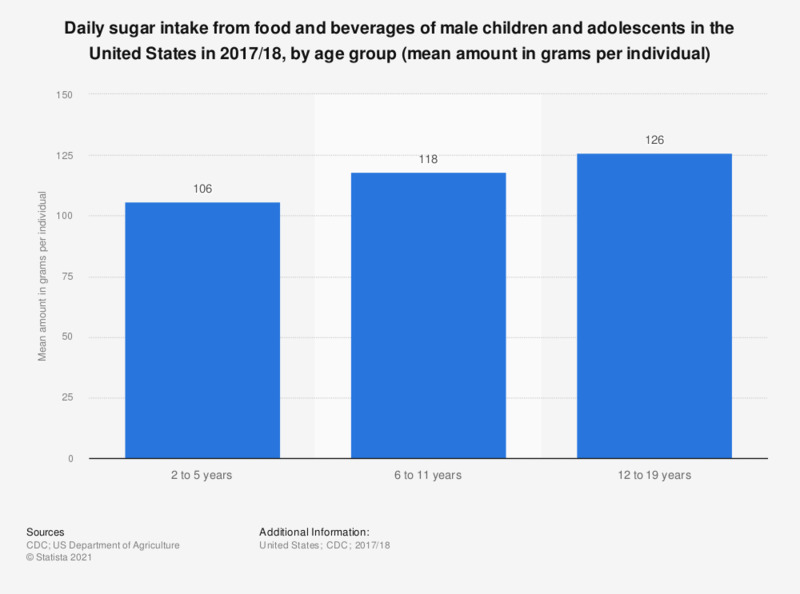 The statistic shows the daily sugar intake from food and beverages of male children and adolescents in the United States in 2015/16, broken down by age group. In that year, 6 to 11 year old U.S. male children and adolescents had a daily mean sugar intake from foods and drinks amounting to 117 grams per person. Intakes of nutrients and other dietary components are based on the consumption of food and beverages, including water, and do not include intake from supplements or medications. The table includes data from individuals 2 years and over. Breast-fed children were excluded because breast milk was not quantified in dietary recall interviews.